They offer a practical means of becoming present, a commonsense approach to physical, mental, and emotional health, and a new way of learning that leads to increased understanding of ourselves and a deepening sense of fulfillment, meaning, and purpose. Breema: The Art of Being Present is a Teaching of the heart that includes the Nine Principles of harmony, floor-based Breema bodywork and the dynamic Self-Breema exercises. In these classes, you’ll learn Self-Breema exercises and multiple sequences of bodywork, all guided by these universal principles. WHAT ARE BREEMA BODYWORK AND SELF-BREEMA? Breema bodywork and Self-Breema exercises use nurturing touch, tension-relieving stretches, and rhythmic movements to create physical, mental, and emotional balance. Breema’s commonsense wisdom guides the practitioner to support the body’s instinctive healing energy, nurturing vitality instead of focusing on symptoms of illness or imbalance. The Breema philosophy and its Nine Principles of Harmony address the essential nature of life, the deeper meaning of health and how to actualize it, and the means of gaining practical, self-verified knowledge that can lead to an understanding of our unique potential as human beings. Every aspect of Breema, including the form of the movement, the atmosphere, the practitioner-recipient dynamic, the practitioner’s quality of touch, and the purpose and effect of the sequence or exercise, is a perfect expression of those interrelated principles. By applying the principles and supporting body-mind connection, Breema facilitates a taste of presence in the body that becomes the foundation of a new dimension of Consciousness. 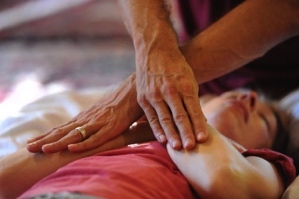 There are a lot of options for attending a Breema bodywork class at True Nature. You can bring a friend, bring your group, or attend our annual Breema Weekend or another prescheduled class. Class lengths can vary from 2 to 6 hours or up to 12 hours for a full weekend. Email us if you have questions or would like to set up a class. Dave also teaches some outreach classes, and you can email him if you are interested in setting up a workshop at your location. In that case, you would typically need to have 6-10 students ready to attend a class. Breema bodywork sequences use a wide variety of rhythmic movements, gentle stretches, and fully-supported postures which are comfortable and enjoyable for the practitioner as well as the recipient. This approach comes from a deep understanding of the unity of all life, and is expressed in practical terms by Breema's Nine Principles of Harmony. The principles help the practitioner become balanced and to conserve energy which is usually lost to physical, mental and emotional tension. They create an atmosphere of real acceptance in which the recipient can most deeply be nurtured. Breema treatments at True Nature are either 30 or 60 minutes, and are received and comfortably padded rugs.Recipients should wear clothes that are loose or stretchy, with long pants and socks. Call 330-473-0402 or email us to schedule a treatment.